Self-Service Pages allow you to embed the "My Account" functionality from BluBilling into your own website. This allows your customer to perform self-service activities such as view their account balances and status, current and past invoices, make payments, etc. All of these self-service screens are already built into BluBilling, and may be quickly deployed within a framed page on your own website so that you maintain brand presence with your customer by keeping your customers on your own website. 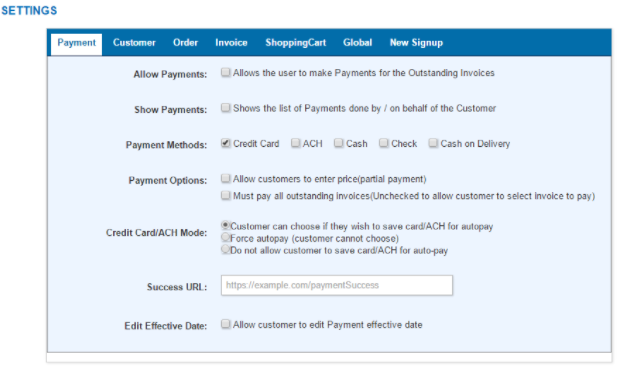 Allow Payments will control if your customer is allowed to make payments on the invoices. Show Payments will show all the previous payments made by your customer. Payment Options will allow the customer to enter the price of their choice if enabled and also controls if the customer can choose what invoice to pay for by letting the customer select the invoice or compulsorily pay for all the outstanding invoices. Credit Card/ACH Mode allows you to to let the customer save their card info on file, force customer for auto pay or donot present the option to save card info. Success url is where your customer will be redirected to after completing payment or if the payment fails. Edit Effective Date allows your customer to edit the payment date. 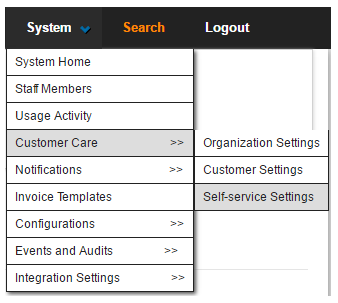 Show Navigation Bar option will show the Navigation bar to your customer when they have logged in. Phone Number Required will make the Phone Number field mandatory. Allow New Order will allow your customer to create New Order. Allow to Add Sales Agent will allow your customers to add a sales agent to their profile. 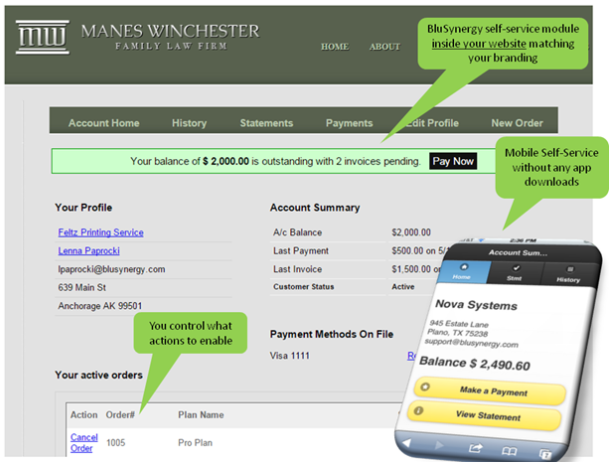 Show Invoices will show all the outstanding Invoices to your customer. Enable PDF Mode Only will enable your customer to download all the invoices as a pdf. This is applicable for people who have bought the Shopping Cart Module and have it enabled in the system. Enable Shopping car in iFrame will allow you to embed the Shopping Cart Widget within your website. The widget will act independently from the site including checkout and payment. Enable guest checkout without registration will not force your customer to create a profile but rather allow them to purchase the product as guest. Enter the Shopping Cart Stylesheet url will control how the shopping cart must look like by allowing your customer to prepare the style sheet and insert the url. This will control the look and feel of your Self Service widget inserted in your customer website.